Several tools are available that make the job of developing a regional ITS architecture easier. This appendix describes three of the tools that are most frequently used in regional ITS architecture development: the National ITS Architecture Hypertext View, National ITS Architecture Databases, and Turbo Architecture. Gone are the days when you needed a bookshelf full of documents to access the information in the National ITS Architecture. 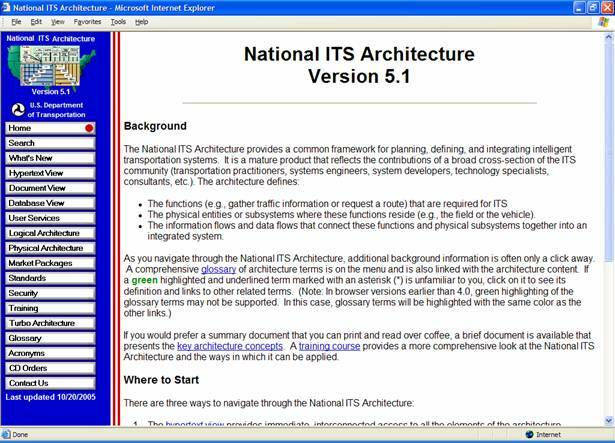 Today, the National ITS Architecture is published on a widely distributed CD-ROM and on the web. 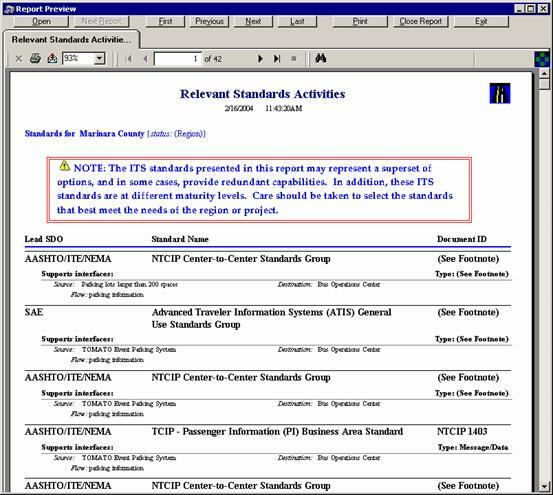 Both the CD-ROM and the Web Site still contain the National ITS Architecture documents – as PDF formatted electronic documents – but the really useful "tools" to the regional ITS architecture developer are two additional views of the Architecture that are also included on the CD-ROM and Web Site: a Hypertext View and a Database view. Both of these views include all of the components of the National ITS Architecture, including the subsystems, terminators, equipment packages, market packages, and architecture flows that are used to support regional ITS architecture development. While the architecture hypertext and database views provide very efficient and powerful ways to access the National ITS Architecture information, they are general-purpose tools that include no built-in features specifically for regional ITS architecture development. Turbo Architecture is a software tool that was developed specifically to support regional ITS architecture and project architecture development and maintenance. Obtaining the Tools and Training: The National ITS Architecture Hypertext View and Databases are available on CD-ROM and on the Internet at http://www.its.dot.gov/arch/index.htm - click on "National ITS Architecture web site". The National ITS Architecture CD-ROM can be ordered by emailing ITSPUBS@igate.fhwa.dot.gov. There is no charge for this CD. There may be differences between the content on the CD-ROM and on the web site. The web site is used to display the latest version of the National ITS Architecture and may include hypertext or databases that are more recent that what is contained on the CD-ROM. The Turbo Architecture software tool can be obtained from McTrans by visiting their web site at http://www-mctrans.ce.ufl.edu/featured/turbo/ or by calling (352) 392-0378, leaving voice mail at (800) 226-1013, or sending e-mail to mctrans@ce.ufl.edu. National ITS Architecture and Turbo Architecture training courses are offered by the National Highway Institute (NHI). Visit the NHI web site (http://www.nhi.fhwa.dot.gov/) for more information. The Hypertext View of the National ITS Architecture provides immediate, interconnected access to all the components of the National ITS Architecture definition. The same Hypertext View is included on both the CD-ROM and the Web Site. The Web Site always presents the latest official version of the National ITS Architecture. The CD provides convenient access to a specific version of the National ITS Architecture hypertext. The Hypertext view is the first (default) view that is presented on the Web Site. The same view is accessed when the CD-ROM inserted or by selecting the index.htm file from the top-level directory on the CD. The system will then bring up the default web browser software and present a window that resembles the one shown in Figure 58. By clicking on the Hypertext View, a diagram is provided (as shown in Figure 59), that identifies each of the components of the National ITS Architecture. Users may select any aspect of the Architecture by clicking on the various highlighted parts of the diagram: User Services, Processes, Data Flows, Physical Entities, Architecture Flows, Equipment Packages, Market Packages, and Standards. The Hypertext view defines all of the components of the architecture, including textual descriptions that are accompanied by graphics for many of the components. For example, Figure 60 shows a graphical representation of a market package for multi-modal coordination. Both text and graphics (in Windows Meta File (WMF) format) can be copied and pasted to support regional ITS architecture definition. The real power of the hypertext view is in the thousands of links between components that allow the user to easily move from one component to any related component with a click of the mouse. For example, the definitions of all subsystems, architecture flows, equipment packages (including functional requirements), and transaction set diagrams that are associated with a particular market package are just a click away. The Hypertext view is easy to navigate through and provides a familiar web browser interface. Its extensive linked presentation of the National ITS Architecture provides a quick reference guide for use when developing a regional ITS architecture. For those stakeholders that are familiar with Microsoft® Access, the database view of the National ITS Architecture provides several databases that contain the same content as the hypertext view. The databases that are available on the web site and the CD-ROM are shown in Table 18. Using Microsoft® Access, specialized queries, forms, and reports can be developed to select relevant portions of the Architecture and to display the selected portions in various formats. This is the Architecture in its raw form without the benefit of formatting and linkage contained in the Hypertext version. The databases can be the most flexible and powerful tools available to the regional ITS architecture developer, but they require significant knowledge of Microsoft® Access and the underlying National ITS Architecture database schemas. Logical Architecture Defines all the processes, data flows, and data stores in the Logical Architecture. Physical Architecture Defines all subsystems, terminators, equipment packages, interconnects, and architecture flows in the Physical Architecture and their connection with the Logical Architecture components. Market Packages Defines the market packages and their relationship to the subsystems, terminators, equipment packages, and architecture flows in the Physical Architecture. SDOMAP Defines the relationship between ITS standards and the Physical Architecture. 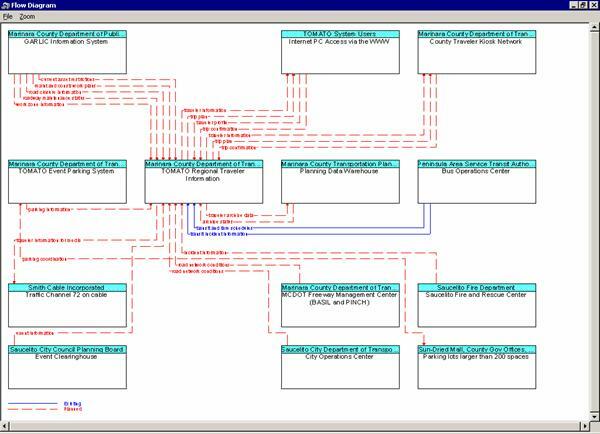 Each ITS standard is identified and mapped to all related architecture flows in this database. This database includes the mapping of architecture flows that have not yet been standardized to standards development categories such as DSRC, Transit Communications, etc. Security Defines the functional security areas of the National ITS Architecture as well as security service considerations for securing ITS subsystems and architecture flows through a determination of the applicable security threats and objectives. Merge a previously-defined Project Architecture into an existing Regional Architecture. The "Turbo Conversion" utility automatically converts existing Turbo databases so they are consistent with the latest version of the National ITS Architecture. This tool provides users a convenient way to migrate their older architectures to take advantage of the new architecture features. The automated portion of the conversion process requires only a minute or two. Specialized conversion reports document all architecture changes that were made during the conversion so the user retains full control over their architecture. Turbo Architecture™ helps the user integrate multiple project architectures both with each other and with a regional architecture. In addition, Turbo Architecture™ provides an initial start toward both architecture development and consistency with the National ITS Architecture. Proper use of the Turbo Architecture™ tool, however, requires the Turbo Architecture™ user to be familiar with the National ITS Architecture. The user enters their region- or project-specific information into the tool, and generates an architecture that can be customized to their needs. There are two ways to initially enter information into Turbo ArchitectureTM: via an interview or directly into tabular forms. The interview guides the user through a series of questions and options that result in the creation of a transportation systems inventory and a set of services. The user may also go directly to a pair of tabular forms to create this initial inventory and set of services. In either case, this information initiates the development of an ITS architecture. Once this initial data input is complete, the user can begin to customize their architecture, which is a necessary next step. Both the interview and tabular forms help the user identify and extract the pertinent National ITS Architecture pieces they require. In addition, Turbo ArchitectureTM allows the user to map and tailor local system names and descriptions to match local needs, services and systems. The user can also extend their architecture beyond entities and interfaces defined in the National ITS Architecture by adding their own information flows and entities for those areas not covered by the National ITS Architecture. Figure 61 shows an example of the Interfaces Tab for a Project Architecture that is part of a larger Regional Architecture. Once the architecture has been customized, there is the issue of how to present the information to stakeholders. Turbo ArchitectureTM answers this need with multiple useful output reports and diagrams that are available for display and printing. The underlying information describing the architecture is also available for exporting as data sets, which can be further, analyzed. Figure 62 shows an example output—an Architecture Flow Diagram of the elements and information flows from a Regional Traveler Information Center to users and other centers in the region. Figure 63 shows an example report available from Turbo ArchitectureTM. This particular report, Relevant Standards Activities, identifies which ITS standards the region or project may want to consider as they implement specific interfaces of their architecture. Turbo Architecture™ helps the user integrate multiple project architectures with each other and with a regional architecture. In a single file the user can create a single regional architecture and multiple project architectures.